In our last lesson, An Introduction to Effective Use of Melody, we spoke about the importance of melody when it comes to soloing and explored a visual technique intended to help you write solos with stronger melodic sensibilities. In today’s lesson, I'd like to pick up from where I left off and talk about a few other intervallic techniques that I like to use when composing my solos. One of the most common traps guitarists fall into when learning to solo is they end up constraining themselves to the “box shape.” While “boxes” are a great learning tool to start familiarizing yourself with your fretboard, I've noticed a lot of my students starting to rely too much on this visual technique when soloing. The result is they just start playing up and down their scales and end up with solos that lack melody and character. In today’s lesson, I want to break you out of the mindset of composing with just half-note and whole-note intervals — which is common to hear when players get stuck playing up and down their scales — and start using larger-note intervals to compose more colorful solos. For our first example, we will again start off by thinking about the first position of the G major scale; starting from the third fret of the sixth string and continuing up the scale to the eighth fret of the first string, which also falls within the key of E minor. Now I want to introduce you to an arpeggio-type movement, which will allow us to incorporate a range of different motions when soloing in this particular position. What I've done here is simply marked out two octaves of the same arpeggio of the E minor chord. And remember, we are not thinking of this movement by itself as a passage of the solo. Rather, we are going to start thinking about how we can move in and around this little movement to create a melodic passage. Think of this arpeggio movement as a framework you can use to construct your solo passages around. For example, we can start introducing notes within the E minor scale while moving around the arpeggio. What this exercise does is encourage you to think more out of the box, so to speak, when it comes to your moving between notes, and it starts getting you used to more interesting intervallic movements. Next, we're going to work on another arpeggio movement with even larger intervals. Here we'll be using one note per string while moving across the fretboard to create the movement that can be used when soloing over this E minor chord. These movements improve your visual navigational skills around the fretboard, allowing you to be more dynamic in your movements and thus compose solos with stronger melodic sensibilities. For example, we can combine the first movement (Tab 3) and the second movement (Tab 4) to create a passage incorporating more interesting intervals. This way you, will not be just going up and down the scale mechanically. The third movement I want to introduce to you is yet another simple arpeggio of the E minor chord. We'll be starting again on the seventh fret of the fifth string and playing the root, third and fifth notes of the E minor chord. The goal of these exercises is to change the way you see the fretboard and ultimately the way you move around it when soloing. You can use these movements as a base to help you move more freely and more dynamically, instead of getting stuck just playing up and down the scale. For example, as you know, when a singer composes a vocal melody, the movement of the notes is rarely just up and down the scale. More often, it’ll be a melody using larger intervals between notes. These exercises will help you introduce the same sense of melody into your solos. 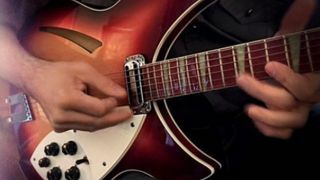 To really make use of the ideas in this lesson and the lesson before, you should start experimenting by creating these movements around the fretboard. For instance, if you are soloing in E minor, you can use a G major arpeggio as a movement to base your solo passage on when soloing over a G major chord. You can do likewise with the other chords in E minor. The goal is to keep expanding your visual thought process when it comes to your movements in soloing and to start seeing the fret board in a more colorful way. By doing this you can start freeing up your creativity to compose solos that are melodic and timeless.